Dutch rabbi; born in Leeuwarden, Holland, 1808; died in The Hague Dec. 13, 1893. He was the son of Rabbi Samuel b. Berish Berenstein, chief rabbi of Amsterdam, and was a dayyan of that town at the time of his father's death in 1838, continuing in that position for the following ten years. 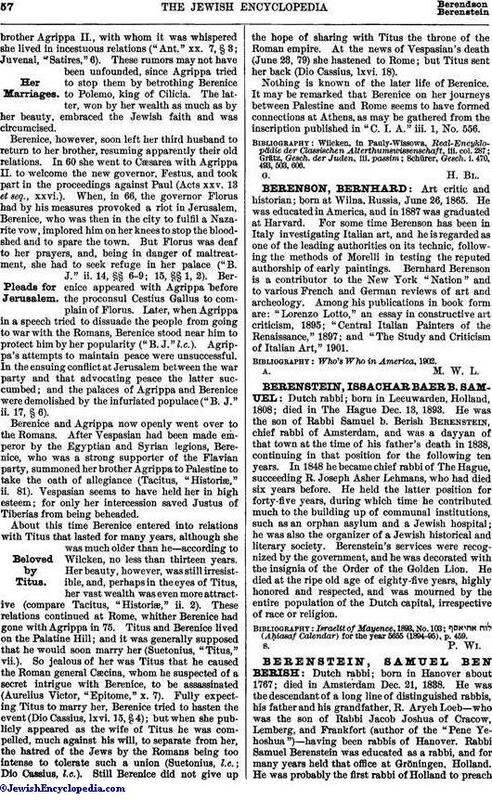 In 1848 he became chief rabbi of The Hague, succeeding R. Joseph Asher Lehmans, who had died six years before. He held the latter position for forty-five years, during which time he contributed much to the building up of communal institutions, such as an orphan asylum and a Jewish hospital; he was also the organizer of a Jewish historical and literary society. Berenstein's services were recognized by the government, and he was decorated with the insignia of the Order of the Golden Lion. He died at the ripe old age of eighty-five years, highly honored and respected, and was mourned by the entire population of the Dutch capital, irrespective of race or religion. (Aḥiasaf Calendar) for the year 5655 (1894-95), p. 459.